The orbiter Discovery lands at KSC's landing facility after a four-million-mile journey. In this historical photo from the U.S. space agency, a four-million-mile journey draws to a flawless ending as the orbiter Discovery lands at KSC's Shuttle Landing Facility, Runway 33. Main gear touchdown occurred at 7:37:19 a.m. EDT, April 17, 1993. 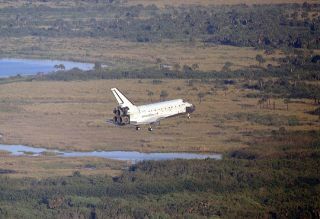 This was the 15th end-of-mission landing at KSC, the 5th for Discovery. Mission STS-56, the second Space Shuttle flight of 1993, lasted nine days, six hours, eight minutes. On board Discovery are a crew of five and the Atmospheric Laboratory for Applications and Science 2 (ATLAS 2), flying for the second time.